HIGH SCHOOL VS. COLLEGE | RAWR BOWS. With all these back to school videos I've seen recently on YouTube I am really getting into the back to school spirit, even though I don't start school until October... Anyway, I thought I would do one of these fancy back to school posts where I talk about some differences between high school and college. I never had lunch in school since I always finished at 2-3pm but I did have a snack break at around noon where I ate a sandwich or something to give me energy. My mom always used to prepared those snacks for me. In college, though, you'll have to prepare your food yourself and you'll find that many time you will a)not have time to prepare anything b)not be bothered to prepare anything c) will have no food to prepare anything. So you'll have to buy something on the go or at you college's cafe which will probably result in a rather unhealthy diet. In high school your parent probably made sure you went to bed at a reasonable time on school night (which you probably hated). When you first move out to go to college you'll be all excited about being able to go to bed at whatever time you want. Yes, you can go to bed at 5AM on a school night if you want but you'll regret it the next morning when your alarm goes off at 7AM and you can barely keep your eyes open in lectures. This will happen a lot during the first few weeks, then you'll learn to go to bed early. In high school you were probably driven around by your mom/friends and you didn't have to take public transport to go to school. In college, though, you'll probably have to either walk loads or take public transport which is alright unless when it's raining and the damn bus doesn't seem to come anytime soon, or when you're kinda late to school and the bus decides to be delayed. I think this might be the other way around for many people but in high school I didn't care what I looked like - I never wore make-up and didn't pay much attention to my outfit, i.e. I wore sweatpants way too often. In college though, I take my time to put myself together and do my make-up and plan my outfit the night before. I guess this is due to living in a big city so there will always be people looking gorgeous around you and you try to look decent at least. In high school you probably spent about 7 hours a day in school, sitting on a chair listening to some boring lesson. In college you might spend as little as 7 hours a week in class (unless you decide to do chemistry and have to spend 5 hours every day in labs... lucky me). However, this means that you should be spending more time at home keeping up with all your subjects even though most people use this time to sleep or go clubbing, I'm just being honest here. 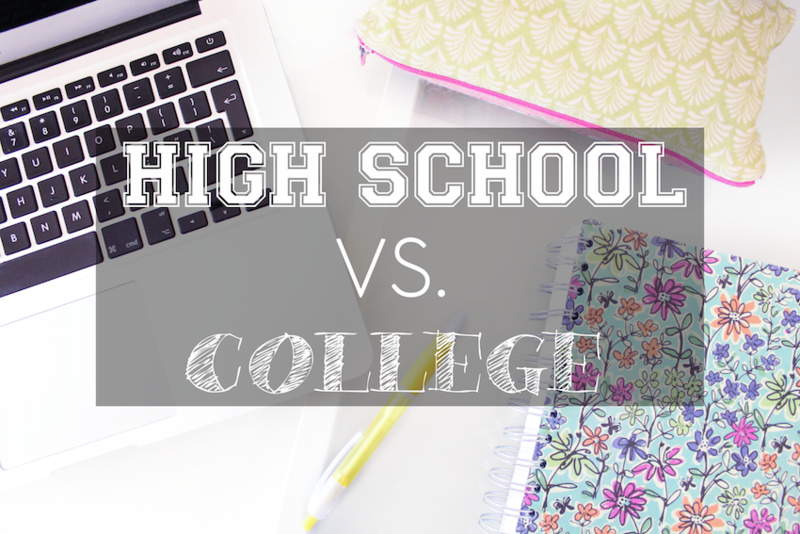 There are obviously many more differences between high school and college but I didn't want to make this post too long. If you would like to see another similar post, let me know in the comments! !